Experience an interactive, multimedia learning environment! 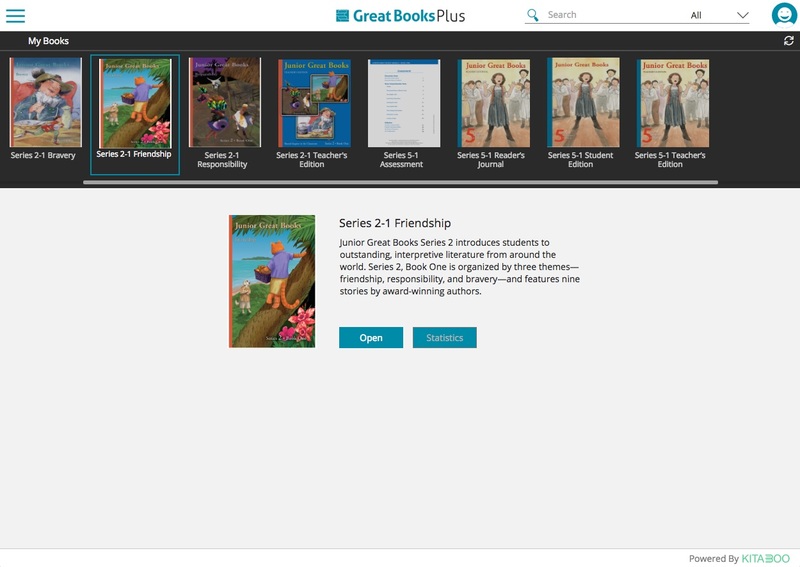 Great Books Plus is a new digital solution that supports student learning and engagement with Junior Great Books while offering classroom management tools and analytics. 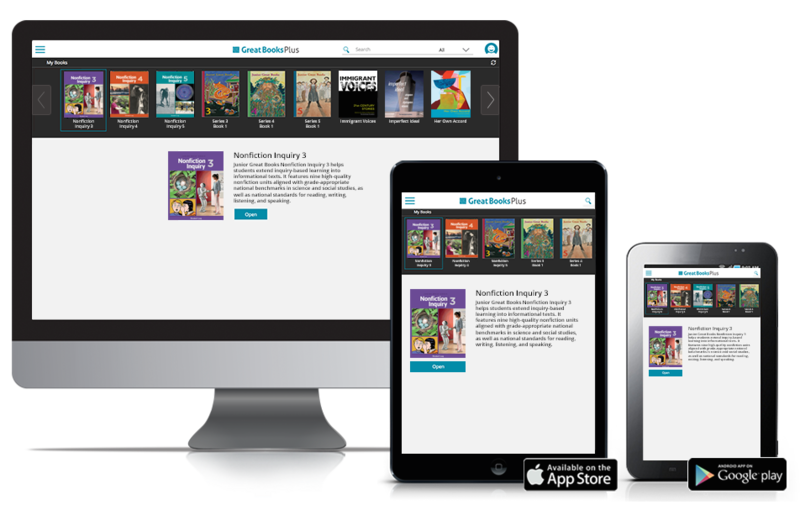 Enjoy all the features and benefits of Great Books programs, plus so much more! For classrooms, homeschoolers, and individual users. 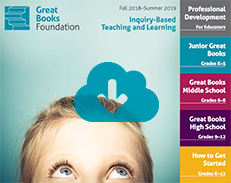 Great Books Plus brings you our classroom materials in a handy—and incredibly useful—digital format. On the home page, you can open your books and access classroom statistics. Scroll down to see the interactive features that make our digital solution such a rich learning environment. The Statistics tab allows students and teachers to access relevant metrics. 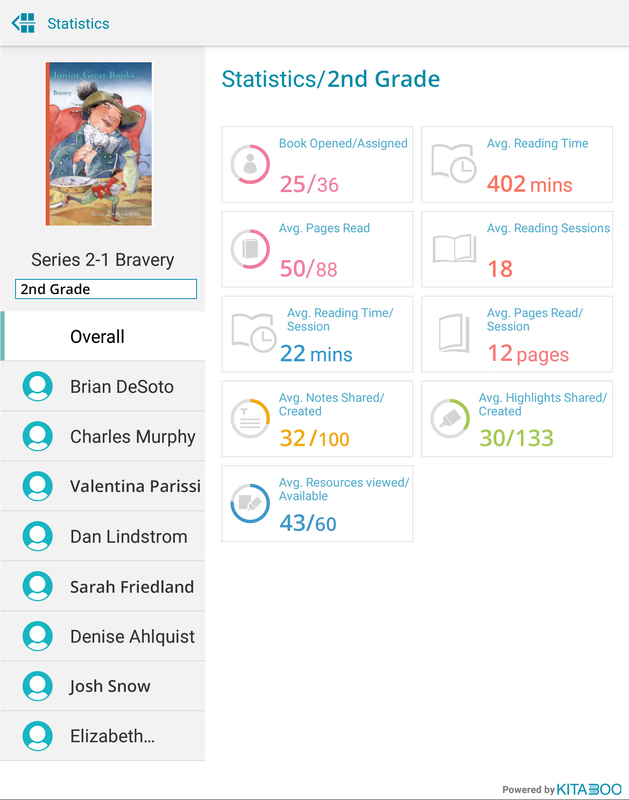 The teacher can view metrics for the entire class or individual students. Students can view only their own statistics. 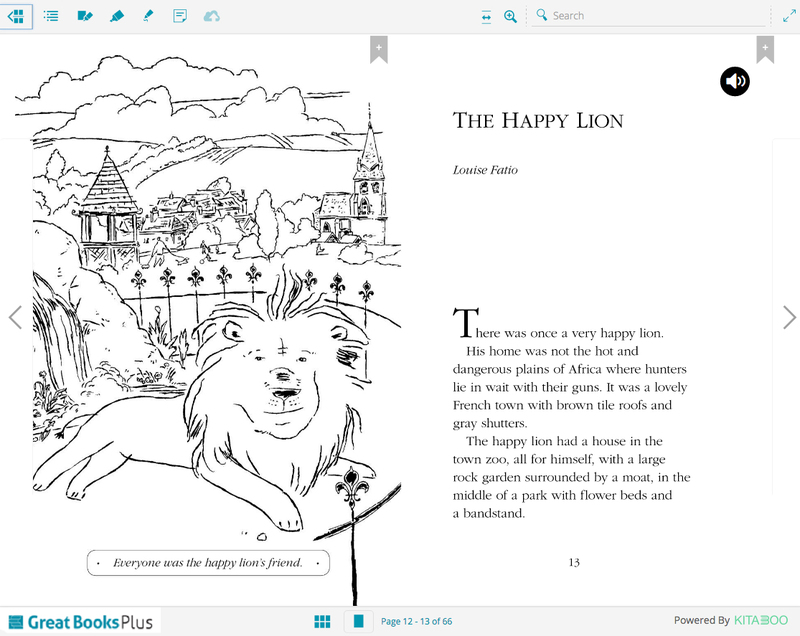 Great Books Plus displays our books electronically with the same great look, pagination, and illustrations used in the print editions but with a variety of tools students and teachers can use to enhance their learning experience. Scroll down for a complete guide to the toolbar shown at the top of the page. Click the Back to Bookshelf tool to access your entire collection of digital Great Books. 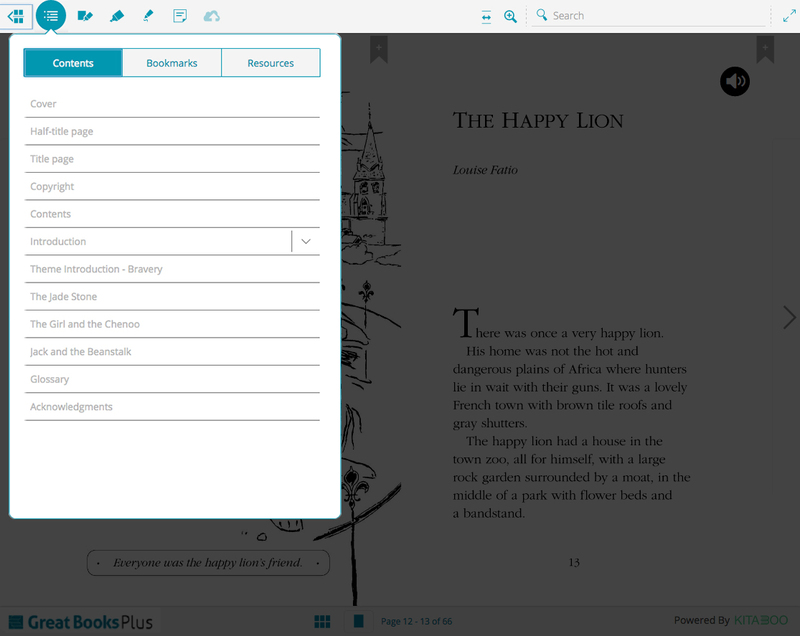 The Contents tool shows you the table of contents for the book you are in. My Data shows notes and highlights made by either yourself or your students. Click on the Highlight tool to activate it, then click anywhere in the text to define the area you wish to highlight. Click on the Pen tool to circle text, draw in the margins, or to write or draw anything you’d like in the book. The Note tool allows you to post a note anywhere. Click on the tool, then click within the text to activate the note. The Submit tool (for students) enables you to submit work. 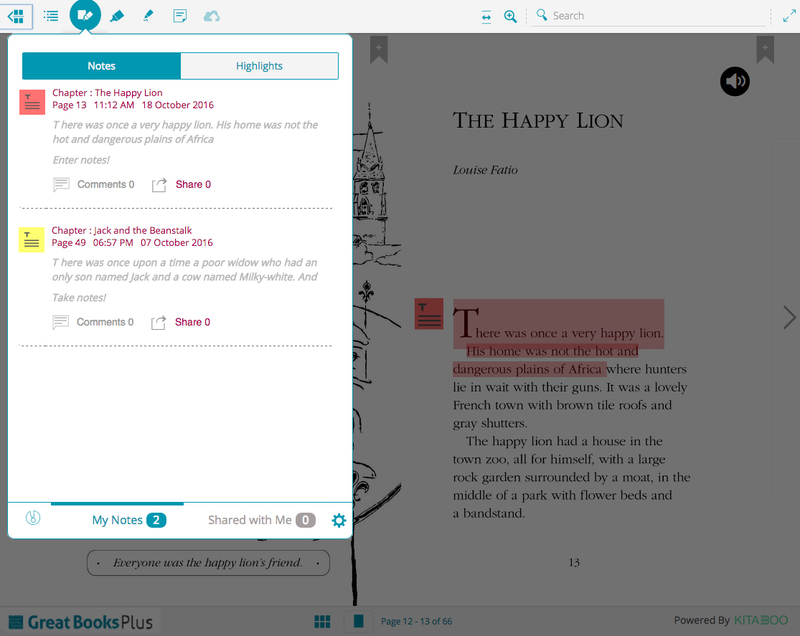 The Review tool lets teachers review student work. Students click on the Audio button to play audio for the book page by page. In the Teacher’s Edition, the audio button on the first page will play the entire selection. Click on the Bookmark to bookmark any page. 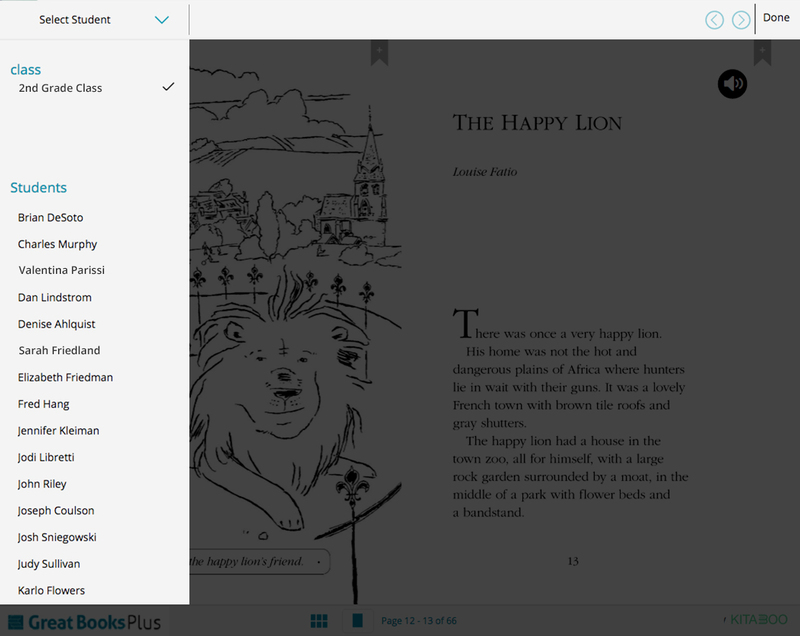 Bookmarked pages will show up on the Bookmarks tab inside the Contents tool. The Contents tool shows you the table of contents for the book you are in. Click on any element in the table of contents to navigate there immediately. Note: You can access the Contents from any page for quick navigation. There are three pull-down tabs within the contents tool: Contents, Bookmarks, and Resources. Resources gives you immediate access to such features as audio files and videos in the Teacher’s Editions. There is a thumbnail table of contents at the bottom of your screen whenever you are in a book. Use the bar to scroll to pages quickly, or type in a page number. Toggle back to single-page view if desired. My Data shows notes and highlights made by either yourself or your students. Click on the noted highlight or note to navigate there. To share, click on the gear tool on the lower right. You can choose with whom to share and from whom to receive notes. You will receive a notification to accept sharing when someone shares with you. The My Data tool will show a red circle over it when someone has shared with you. Click on individual notes to respond to the sender. They can respond back as well. Click on the Highlight tool to activate it. Then click anywhere in the text to define the area you wish to highlight by clicking and dragging the round handles. Choose yellow or red for your highlighting color. Within the Highlight tool, click on the + icon to create a note. Once you have created the note, you can post it. This action will make the note show only in your own book. You can click on the note to share it with the teacher, individual students, or the whole class (which includes the teacher). 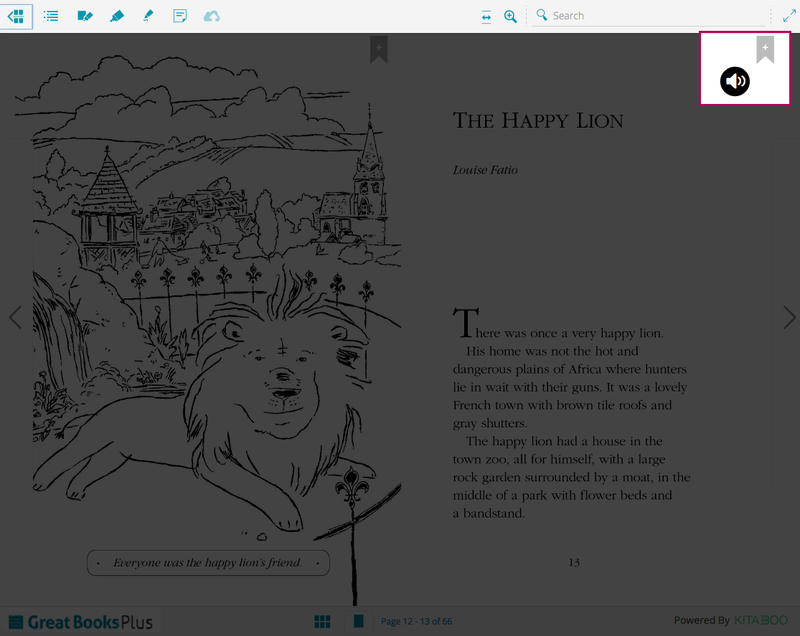 Tablet users: Tap directly in the text to activate the Highlight tool. 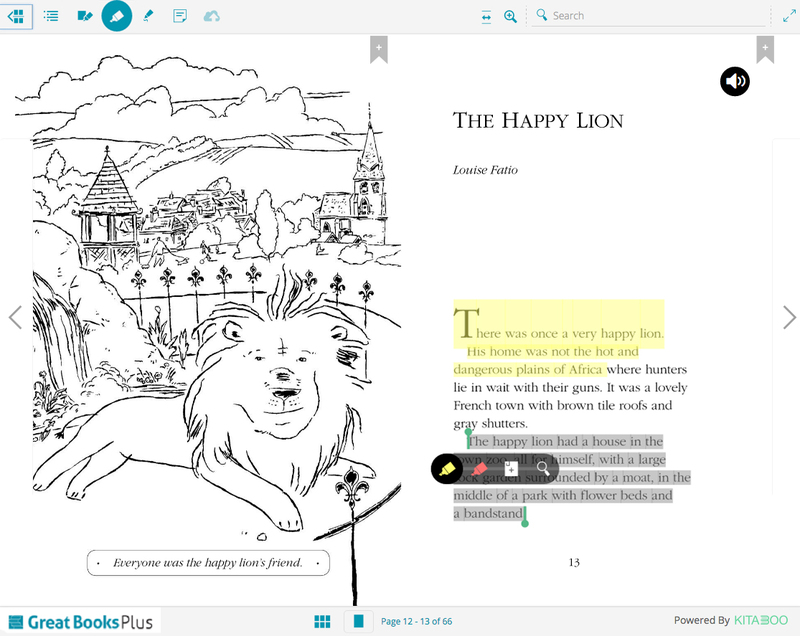 Click on the Pen tool to circle text, draw in the margins, or write or draw anything you’d like in the book. To stop using the Pen tool in the web app, click on the return arrow; on a tablet, tap Done. Note: Students may find it handy to use the Pen tool to mark answers on the assessments. The Note tool allows you to post a note anywhere. Click on the tool, then click within the text to activate the note. After typing your note, click Post to show it in your text. You also have the option to share the note with the teacher or the class. Once you have posted the note, just click on it to edit it or even throw it away by clicking on the trash can in the upper right corner of the note. 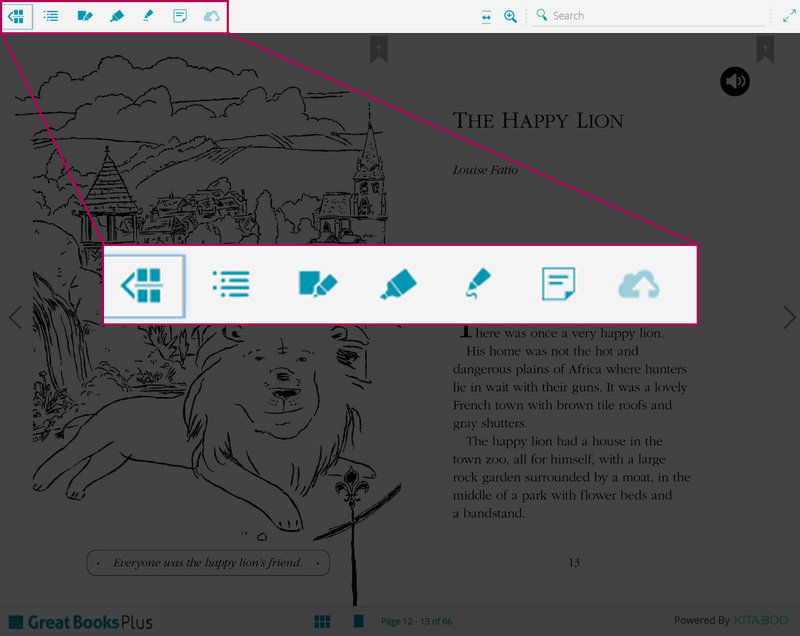 Tablet users: Tap directly in the text to activate the Note tool. 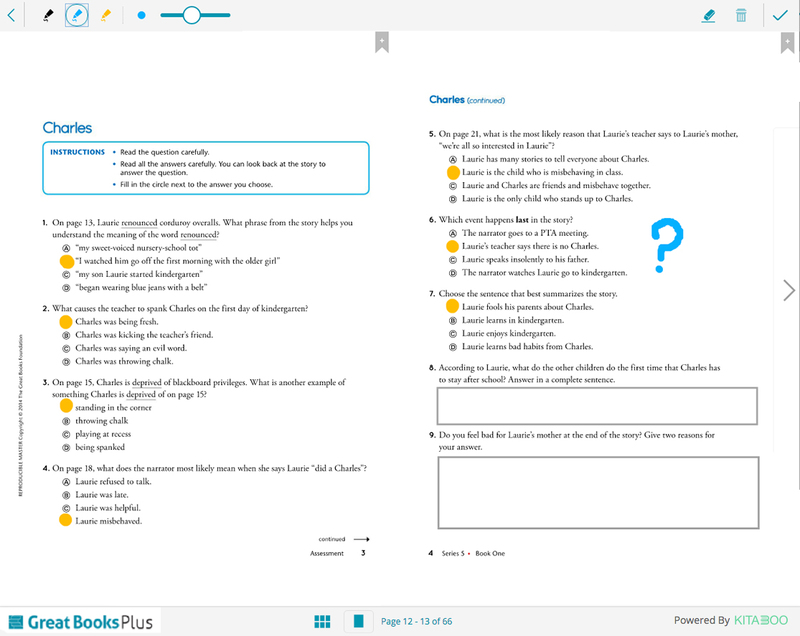 The Review tool lets teachers review student work. Select the tool to see the list of students in your class. Click on individual students to see their work.